I have a plethora of pretty things from my mother that no one wants. I'm paralyzed with procrastination... too pained to donate fragile, lovely homewares cherished by my mother, yet burdened with dust-catching items I rarely, if ever, use. Seems I'm not alone in feeling discouraged that our adult children are uninterested in enjoying, then passing finely crafted family heirlooms down to their children. The Greatest Generation, raised in scarcity during the Depression, treasured stuff. The generations before them collected stuff for use or as mementos of distant or deceased family or ancestral lands. Last month, Next Avenue, a PBS newsletter for those over-50, published its most popular article ever, "Sorry, Nobody Wants Your Parents' Stuff." "This post about a heartbreaking, pervasive problem struck a minor chord in a major way: It was the most viewed article in Next Avenue’s history, garnering more than 1.5 million views, 32,000 Facebook shares and 5,500 comments, and was printed over 3,100 times." "This is so sad and difficult"
"I feel guilty about what I had to do"
I won't let this happen to my kids"
"You're wrong. People want these possessions." "My children have already told me they don’t want any of our antiques because they don’t care for ‘brown furniture.’ Drives me crazy that they prefer cheap furniture made of pressed sawdust and glue, but what’s a mom to do?" "My mother was a serious collector of imported English Victorian antique furniture and spent her weekends throughout my life polishing it to an inch of its life … I cried when her table and chairs were loaded onto a trailer- I hated them but I loved them as well!" "It’s a good thing our deceased loved ones can’t see what’s happening to their prized possessions. Many of them struggled through financial woes and 'made do' during hard times. To see their things pitched and tossed would be heartbreaking for them." "My mother… always preached to me the 'value' of this or that…. Well, I’ve learned that nothing is worth anything if no one wants it... I couldn’t even find buyers for her genuine gold and gem stone jewelry and had to liquidate it for pennies at one of those 'we buy gold' places. I still have a storage unit full of stuff 20 years after her death because in her memory I can’t bring myself to just give it away." 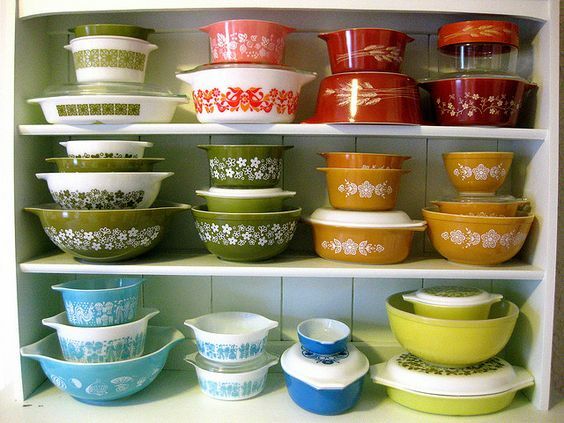 One particular comment rings painfully true... " My mother made me promise to never get rid of certain items so now they sit in the basement because I would feel guilty selling or giving them away." You see, months before she passed away in April 2016, I told Mother that I have her 68-year-old white satin wedding dress. And I asked her, my unsentimental mother stricken with Alzheimer's, what she wanted me to do with it. She paused for a long moment, then slowly responded, "Keep it. Please keep it." I'll likely keep my mother's crumpled wedding dress until the day I die. She considered her 1948 wedding day to be the best day of her 86-year-long life, and she asked me to keep it. I can't bear to give it away to strangers. I could have her dress made into charming decorative pillows for my two daughters, niece, and granddaughter. But sadly, I don't think they care that I long for them to value something of my mother... It's just more stuff that doesn't match their taste. Among other family heirlooms gathering dust in our cupboards and two china cabinets: two punch bowls, one crystal with 18 matching handled punch glasses and two crystal punch ladles. A demitasse set of eight porcelain cups and saucers, hand-painted with Audubon-like birds. 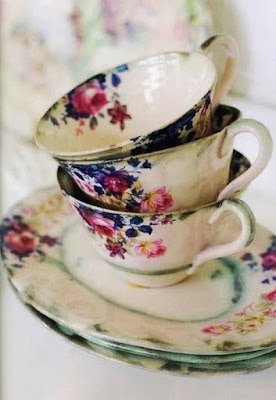 English and French bone china teacups and saucers. Tiny wine glasses. Some cool 1950s pyrex and melmac bowls. Plus an exquisitely embellished linen tablecloth gifted to me 40 years ago by my maternal grandmother. And much more. Despair... "In the future there will be no personal history … only ‘in the moment’ … no graves, no personal letters, no hard copies of long-lasting photographs, no heirlooms …. no footprints in the sand." Laissez-faire... "Personally when I die if someone enjoys something of mine great but it’s not me!! Do whatever you want with my stuff after I die, but keep a good memory of me in your heart!!" ... and "It doesn’t bother me that my girls are not interested in our stuff. It’s just stuff, really." I'm working on the latter. 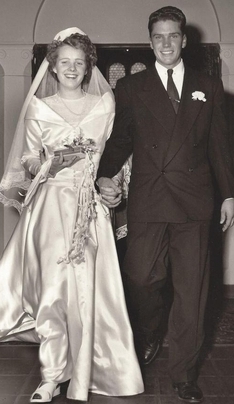 And looking for a seamstress to make heirloom pillows from Mother's wedding dress, including a special pillow for me.